In Pull, the lovers' bedroom is mapped out, through the utility of an array of suspended, crystal punch glasses, interspersed with wooden handles. A bed is seen on the floor, in the center of the map, as well as a monitor, representing the bedroom window. The imagined walls of this representation are set in from the walls of the actual room--this is a room within a room. A visitor pulls on one of the nine wooden handles, and sound associated with that handle emanates from outside of the map, signifying various power points within the room. In the monitor, the visitor witnesses a transmission from a camera trained on the actual window, outside of the map. 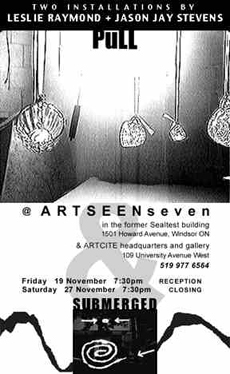 Pull was installed at the former Sealtest building in Windsor, Ontario, in November 1999, as part of ArtSEEN seven.